Airtel has today announced free incoming calls package for all their pre-paid customers. Customers can now avail the benefit of free incoming calls when they are outside their network for a fixed fee of Rs. 5 a day. This move by Airtel is in reaction to TRAI’s recent revision of tariff ceiling for incoming and outgoing calls while on roaming. The rates (for outgoing calls) have been reduced from existing Rs. 1.40 to Rs 1.00 p.m for local and from Rs. 2.40 to Rs. 1.50 p.m for STD calls. Similarly, for incoming calls, the ceiling has been reduced to 75 paise from previous Rs. 1.75 per minute. TRAI came up with the revised ceiling tariffs so that telecom operators could provide better plans for national roamers through special tariff and combo vouchers. During their Jan 17th announcement, TRAI has also mandated all telecom providers to offer 2 types of free national roaming plans. 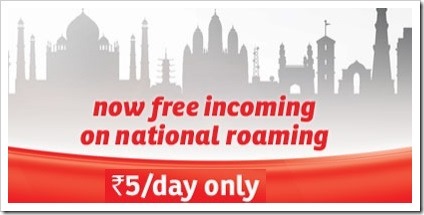 The changes made by TRAI were going to come into effect from today (1st July) and Airtel became first operator to announce free roaming plan in accordance to TRAI mandate. Though Airtel’s has become the first operator to announce free roaming, most other operators are also expected to announce plans on similar lines shortly. Though, we have said earlier that voice call rates in India have bottomed out, it seems the TRAI’s announcement is going to create another mini tariff war when it comes to roaming. In recent times, 2G data rates have also come down by as much as 90 percent with 3 leading operators, Airtel, Vodafone and Idea announcing rate cuts within a gap of one week. Even though the operators are facing heavy pressures of profitability, these kind of announcements are great, when it comes to consumers. I am not complaining at all! So in this case Airtel has started it first…I’m pretty sure that other foxes (read telecommunication companies) will follow it soon…They have to in order to stay in the race…. This is on the expected lines. But Arun, why don’t you come up with your analysis of how the applications like whatsApp, wechat, Line etc are eating away the pie of telecom operators. And whats the future for the telcos in terms of revenue areas ? It would be interesting to see the statistics and facts you come up with. Dear satish – We had written a similar article last year… https://trak.in/tags/business/2012/09/06/smartphone-messaging-apps-threat-sms-usage/ you may want to have a look at it..